The result of the WaterGuide agriculture is a quantification of crop yield response to drought, O2-stress or salinity. This information helps water management and other governments or policy makers to know the impact on agriculture by hydrological measures. The tool is under construction. 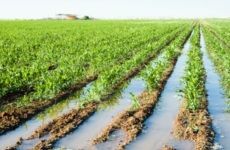 The WaterGuide is based on simulation models for agrohydrology and crop growth (SWAP-WOFOST), linked to agricultural economic expertise as well as agronomy. For the simple tool information is needed on soil and groundwater and the crop that is grown. This will then result in a annual average percentage yield loss related to dry, wet or salt field conditions. Spatial scale: soil pedon; applicable to a soil map and then the soil map can be a region or country. The agronomic context is Northern-European. In due time all free online.